The approach for the second collection is solid, based on the presence of building-like compositional forms and on the skillful use of the materials of which he is an undisputed interpreter. 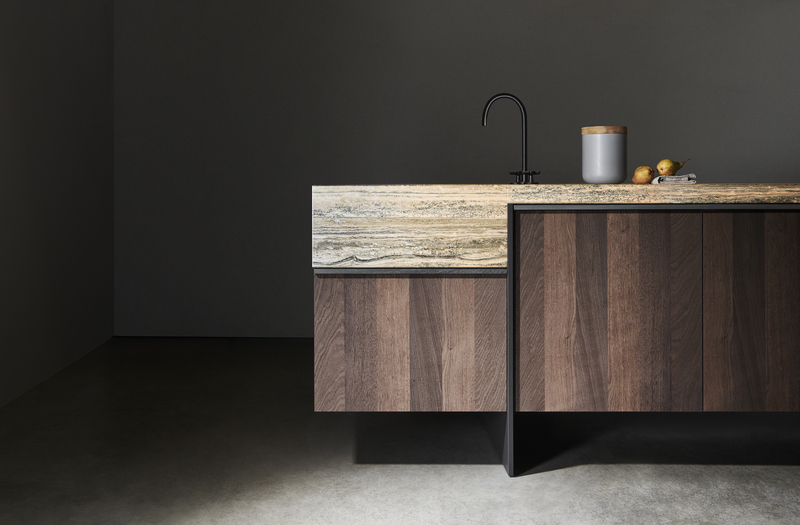 Hence Ratio, a modular kitchen where structure is the undisputed protagonist. Metal grids define the basic architecture, wall units, columns, hoods and accessories. Full volumes, empty volumes and tops of different thicknesses are hooked to the slender and minimal techno/structural elements, creating an elegant interplay of balances. The kitchen is developed over two layers: the structural layer, consisting of the uprights, and the surface layer. The interplay of vertical and horizontal lines gives the product a strikingly graphic and architectural expression, characterised by the scansion of the vertical uprights and by the doors and rear surfaces.